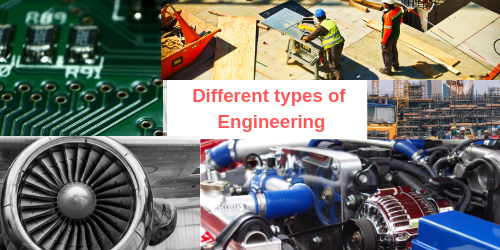 Here is the list of different types of engineering courses which can help you to decide your career. Few of the courses listed here are very rare and some courses don’t available in all universities. Don’t rely only on evergreen courses, many courses are rare and don’t have much competition. You can easily get seats in the top universities for low competitive courses. Low competition doesn’t mean Less future scope. Let’s see the list of different types of Engineering Courses. Electrical/Electronics Engineering is one of the evergreens and oldest courses of all. Some universities offer an integrated course (Electrical and Electronics Engineering) but most of the universities offer it as a separate course. Electrical engineering deals with the study of Power Generation, Transmission and Distribution. Electronics Engineering deals with the study of electronic circuits and it’s behavior in various modes. The following subjects come under this field. Gadgets that will disappear in future. Civil Engineering is also an evergreen field and one of the oldest course. It deals with the study of the construction of a building, Dams, Reservoirs, Bridges and so on. The following are a few of the subjects in Civil Engineering. Mechanical Engineering is also evergreen and oldest course in Engineering. It deals with the study of solids and fluids in both static, dynamic state and also the study of construction, analysis, design, the behavior of different machines. The following are a few of the subjects in Mechanical Engineering. Nowadays, the computer became a necessary part of our life. The Computer Science/Information Technology became popular only after 1990. CS and IT differ only by a few subjects. This field saw rapid growth during the 2000s and getting a good job after degree completion is very easy on those days but the condition has been reversed now. The following are the subjects in CS/IT Engineering. Electronic Devices and Circuits for Computer Engineers. Electronics and Instrumentation Engineering & Electrical and Electronics Engineering share some few common papers. Instrumentation deals with the sensors, Measuring devices, Amplifiers, transducers and so on. Control System plays a major role here. Similar to E&I Engineering, ECE also share electronics paper. Chemical Engineering is a branch of Engineering Science that deals with the study of different types of chemicals, their behavior and their applications in the various field. Chemical Engineers play a vital role in food preservation, Medicine production, Production of Polymers and so on. The following are the few of the subjects in Chemical Engineering. All electives are included in this list. If you want to work in mines like coal, lignite, gold, crude oil then there is a necessity to study Mining Engineering. Mining Engineering has a great future scope but one needs to be physically fit to work in mines. The following are the subjects in Mining Engineering. The following are papers in Aeronautical Engineering. Mechatronics = Mechanical Engineering + Electronics Engineering. The following are the core subjects in Mechatronics. Which is the best Field in Engineering? Hypothetical Question. We cannot predict which course is the best. Many are earning a lump sum from their idea and patent right, even many students are dropouts but they are doing good in their job. How can I choose which field is best for me? Do some research. Nowadays internet is your best guide.Choose a course according your passion. Which type of Engineering has highest salary You can earn more from any engineering field. Is an engineer a scientist? If you study daily, no field is hard. Which Engineering is best for future? In my point of view, the following areas have more future scope.Artificial Intelligence, Machine Learning, Home Automation and Industrial Automation. Country wise it differs. In my country (India), we have more engineers (more than a demand). Not every Engineers get a better job opportunity. Do engineers get well paid? Only few are getting well paid. Publisher of this blog Hey zZooMers, I am Abishek from India. I just started this blog to provide information about Electrical and Electronics Engineering. You can surely expect many more from my side. Here I write about Basics, Electrical, Electronics, News related to Tech and safety which should be followed in Engineering. If you don’t want to miss any information, Just subscribe to my blog. Where Drones are employed nowadays?